Predators and aliens (or the Yautja and xenomorphs, if you’re a nerd) have always been pretty close cousins in the world of sci-fi horror, even starring in a couple of lousy movies together. 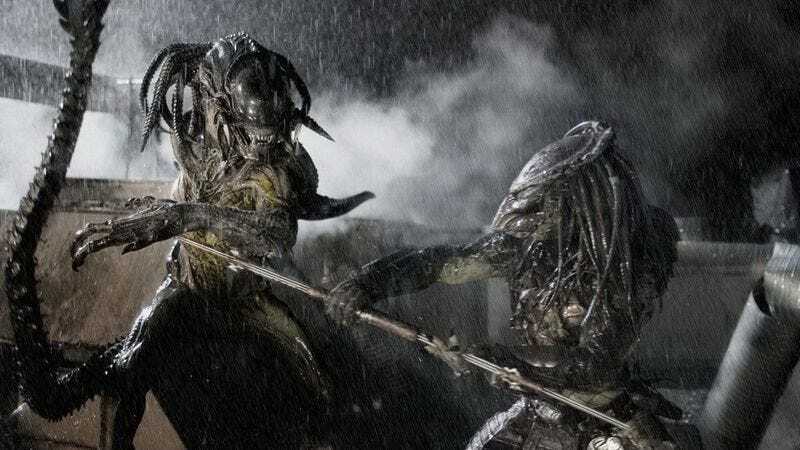 As 20th Century Fox tries to revitalize the Alien and Predator franchises, though, the two monsters have once again gone their separate ways and each have movies of their own in the works again. Shane Black is making The Predator, and Ridley Scott is making a Prometheus sequel that is called Alien: Covenant for some reason, and now Collider has the new release dates for both films. Alien: Covenant, which has been dropping and adding cast members pretty regularly this month, will be in theaters on August 4, 2017. The movie was originally supposed to be released that October, but it has been moved back—presumably so Scott won’t be able to change its title again. The plot will reportedly revolve around the crew of a ship that stumbles upon a “paradise” planet that is inhabited only by Michael Fassbender’s android David from Prometheus. The Predator has only popped back up on the motion tracker recently (that’s an Aliens joke), but we know it’s being directed and co-written by Shane Black and will apparently be an “inventive sequel.” Also, despite a teaser image promising that we’ll “never see him coming,” Collider says that The Predator will be in theaters on March 2, 2018. Right now, that means it’ll be opening up against an “untitled WB event film,” which is almost certainly about superheroes, so either this or that will probably move.